One of the two 45-tonne ion cyclotron resonant heating antenna systems that will deliver 10 MW of heating power each into the ITER machine. Temperature, from a physicist's perspective, is not only a measure of hot or cold. It is also a measure of the energy carried by atoms and molecules: temperature tells us how rapidly these atoms or molecules move within a solid, a liquid or a gas. Temperature is different from heat. To feel heat on your fingers, you need density: the higher the density, the more heat is transferred to your skin—this explains why a neon tube containing a very hot (~10,000 °C) but very tenuous plasma can be touched without harm. In temperature, there is a theoretical absolute cold ("absolute zero") but no absolute hot: a particle can always move more rapidly but it cannot be more immobile than ... immobile. 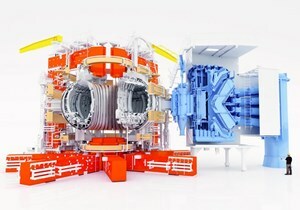 When we talk about a 150- to 300-million-degree plasma in ITER, we're describing an environment where particles (the deuterium and tritium ions and the freed electrons) move around at tremendous speed: so fast and with such a high energy that when they collide head on the miracle of fusion happens. The electromagnetic barrier that stands between nuclei is overcome and the nuclei can fuse. ''The reason we'll have all three systems in ITER is to have them compete in the nuclear environment — this is precisely what the 'technological viability' demonstration is about'' , says ITER Deputy Director-General for CODAC, Heating & Diagnostics Paul Thomas. How will the ITER plasma be brought to such extreme temperatures—ten times higher, or more, than the core of the Sun? Plasma heating in ITER will begin with an electrical breakdown, quite similar to what happens when we turn on the switch of a neon light. In the very tenuous gas mixture that fills the vacuum vessel (one million times less dense than the air we breathe) the electrical discharge strips the electrons from the atoms and the gas becomes a plasma—a particle soup of electrically charged electrons and ions. 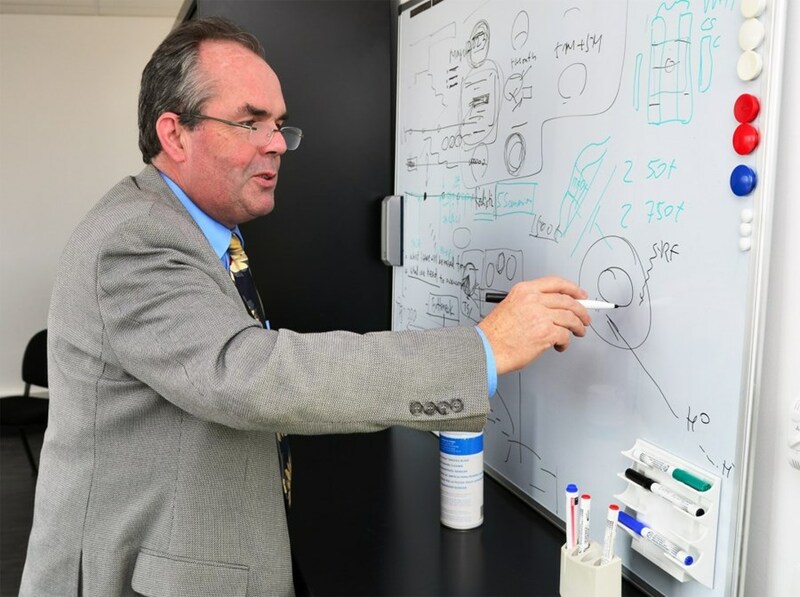 "The electrons from the current collide with and communicate their energy to the ions from which they have been stripped," explains Paul Thomas, ITER Deputy Director-General for CODAC, Heating & Diagnostics. "Current intensity grows steadily and, as plasma resistance increases due to the collisions between electrons and ions, temperature also rises—this is Ohmic heating, like in a bread toaster or an electrical radiator." However, contrary to what happens in metals, plasmas have an unusual property in terms of resistivity: the hotter they get, the less resistive they become. This means that Ohmic heating can heat a plasma only up to a point. "For a long time," Paul recalls, "some fusion physicists dreamed they would achieve fusion with Ohmic heating alone by increasing the magnetic field. Even today, the project called Ignitor is based on this assumption. The problem is that the more intense the magnetic field, the stronger the mechanical strain on the machine's structure..."
Neutral beam heating (here in JET, in blue) has been the workhorse of additional heating in tokamaks. Ohmic was the only heating source on the Soviet T-3, which achieved plasma temperatures in the range of 10 million degrees in the late 1960s—an achievement that left the nascent world fusion community agog and launched the tokamak race worldwide. Achieving fusion, however, requires temperatures approximately ten times higher than what Ohmic heating alone can provide. In the 1970s, the fusion community began experimenting with additional heating techniques based on radio frequency (RF) waves, or the injection of energetic atoms into the plasma. Yes, radio waves can heat. 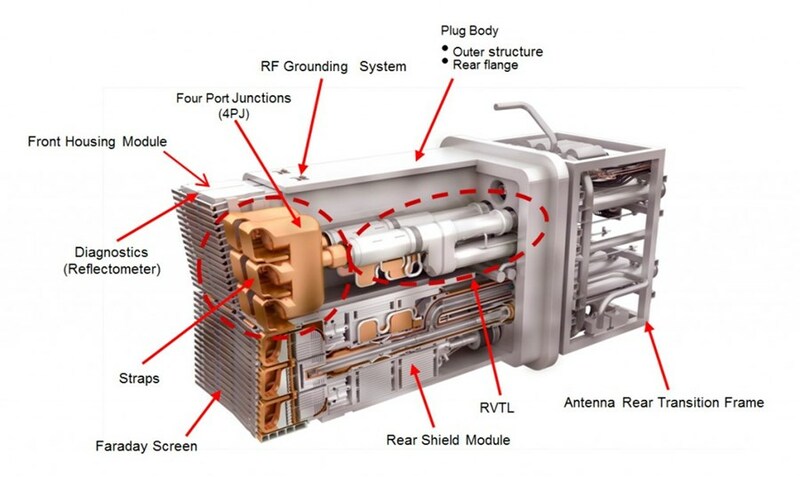 Whether at 40-55 MHz, like shortwave radio (ion cyclotron); a few GHz like microwave ovens (lower hybrid) or many tens to hundreds of GHz like very advanced radar (electron cyclotron), sending electromagnetic into the plasma can deliver enough energy to push it into the fusion regime. 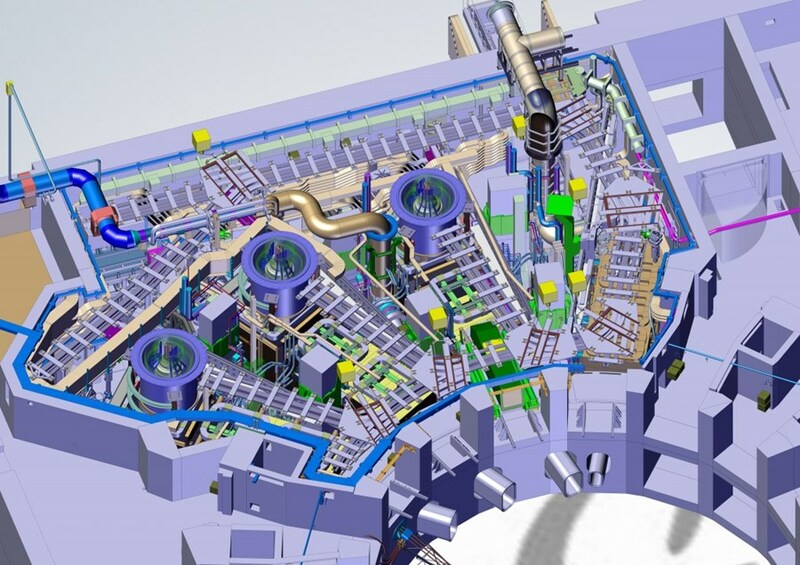 ITER will be equipped with an electron cyclotron and an ion cyclotron heating system, both delivering 20 MW of power. But the workhorse of additional heating in tokamaks has been neutral beam heating—the injection of high-energy neutralized particles deep into the plasma. Neutral beam heating is a bit like heating the milk in a pot by using a jet of hot steam from the espresso machine, what French garçons de café systematically do when you order cappuccino. As hot molecules from the steam jet collide with those of the cold milk, energy is transferred and hot milk is ready to be poured in the coffee cup. "Exploitation of the neutral beam technologies we will use was pioneered in Japan," says Paul. We have a very strong collaboration with our friends in Naka. Neutral beam technology is also used on JET (ITER's neutral beam system will deliver seven times the energy of JET's). 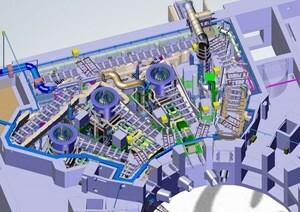 ITER's neutral beam system will deliver seven times the energy of JET's. The challenging technology of ITER's neutral beam system will be tested in a dedicated installation that was inaugurated a year ago almost to the day: the PRIMA Neutral Beam Test Facility in Padua, Italy. In parallel, IPP Garching is developing ELISE, an ion source half the size of ITER's; success on this test bed will greatly reduce the risk associated with the final development of the full-size ITER ion source at the SPIDER test facility. ITER's three heating systems—electron cyclotron, ion cyclotron and neutral beam—feature different levels of technical complexity, maintainability and ease or convenience of use. The balance between these features is such that all three should be tested on ITER and developed to the point where a decision can be taken on which should heat a reactor, according to Paul. "The reason we'll have all three systems in ITER is to have them compete in the nuclear environment — this is precisely what the 'technological viability' demonstration is about."